Crafted from the bones of the fallen. a veritable toxin to any living being. A second Gravelord Sword will not be added to the inventory on joining the Covenant in NG+, unless the first sword is upgraded (to at least +1). However another one can be picked up from another players. One of the only two weapons in game which can inflict toxin, the other being the Dark Silver Tracer. The weakest of all the Curved Great Swords, yet also the most versatile due to its strong thrust attack, making it applicable in cramped quarters. Curved Great Swords are a good choice for DEX builds in terms of damage and stun potential at the cost of slow attack speed and high weight compared to other DEX weapons with high DEX scaling. Can be a viable starting weapon due to its early availability and easy accessibility. A wide attack range and deal high damage to mostly every enemy in the game, barring those who're very resistant to physical attacks and slash damage. Its high base damage and E rating in STR and DEX allows the user to increase other stats besides STR and DEX as it doesn't need the investment in either of those two. When going up the bridge, before going into the next cavern area, stand to the far right of the door, then look back and down: see the area below. Simply roll, fall down and land near the area before the Titanite Demon and the interactive coffin. To do this, be at full health and Make sure to roll when landing to avoid any enemies aggroed. 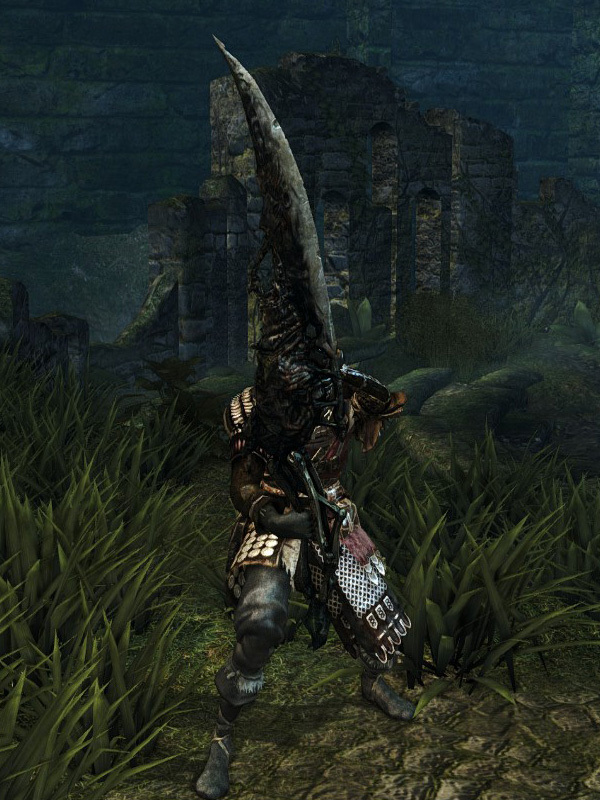 Run straight for the Titanite Demon, keepingshield up. Bypass him and grab the Eye of Death x3 behind him, then quickly run back to the open coffin. The Titanite Demon will take the majority of the time slowly crawling around, and will likely not attack. If he does attack, he can deal damage to and kill the user lying in the coffin. Once the cutscene activates, the player will be transported to Nito's Lair. Simply join the covenant, then Darksign/Homeward Bone back. Because of its power and easiness to upgrade to +5 by time of completing Anor Londo, this weapon is great for speed runs or for people trying to build characters more quickly through the NG playthrough. The weapon also makes it easy to acquire Rite of Kindling early as well, since Pinwheel is too weak to withstand a lot of hits from it. Strong attacks are replaced by a powerful thrust attack. 13% STR, 13% DEX scaling.